The HTL80186 is a high-performance embedded processor core supporting an instruction set identical to an Intel's© 80186 microprocessor. 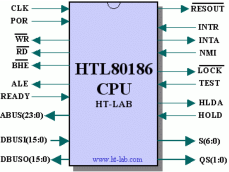 The HTL80186 is software compatible with the 8088, 8086, 80188 and 80186 microprocessors from Intel/AMD and uses standard 16bits compilers and development tools. The processor can be configured for an 8bits (80188) or 16bits (80186) external databus and/or behave like an 8088/86 processor. 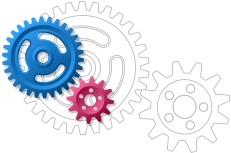 The extended addressing mode first introduced by VAutomation's Turbo186 cores is also supported. Enabling this mode extends the real mode addressing range from 1MByte to 16Mbyte. The Turbo186 mode is supported by Paradigm C++ IDE and Micro Digital's SMX real time kernel. Note: the HTL80186 is a microprocessor core without any embedded peripherals, however these can easily be added and are available from HT-Lab and other IP vendors. For a 186 based micro-controller see the HTL186C core. A non-cycle accurate Instruction Set Simulator is available as a free download from here. The HTL80186 can be delivered in a padless EDIF netlist version for Xilinx, Altera or Actel or in full vendor neutral synthesizable VHDL source. The source code is fully documented and can be synthesized using any modern synthesis tool. Synthesis examples are provided for Xilinx XST and Altera QNS. A simple testbench is provided which boots FreeDOS from a bank switched memory image. For evaluation the HTL80186 can be supplied on a low-cost FPGA development board from Enterpoint Ltd. The HTL80186 is instantiated together with a number of peripherals such as the HTL8254 Programmable Timer, HTL8259 Programmable Interrupt Controller, HTL16550 UART, HTL8255 Parallel I/O, HTL146818 RTC, Watchdog timer and 40Kbyte of SSRAM. No VHDL source files will be supplied in this case. Other prototype boards such as Enterpoint Drigmorn2, Digilent Nexys2 and Actel's Cortex M1 boards are also supported. A porting service to other FPGA boards is also available. All trademarks mentioned on this web page are trademarks of their respective owners.